Send the best fruit and gourmet! Royal Fruit & Gourmet Basket. We pack a large wicker basket with only the finest fresh seasonal fruits and gourmet specialties for a truly royal treat. Hand delivery ensures this basket will arrive at its peak of flavor. Fruit may include crisp apples, bananas, sweet oranges, juicy pears, plump grapes, nectarines, pineapple, kiwi and more as available. The gourmet items may include cookies, crackers, cheeses, and chocolates. Exact basket and fruit/gourmet selection may vary by season and delivery location. Deluxe basket is shown. 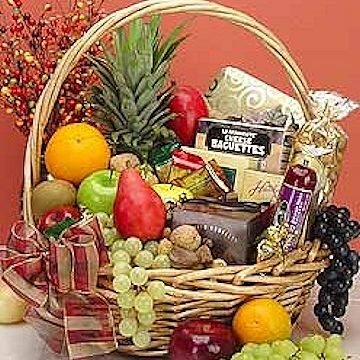 Royal Fruit and Gourmet Basket has been purchased most frequently by our customers for the following occasions: Sympathy, Get Well, Christmas, Thank You, and Birthday.